Vince Warren on How Police Officers Get Away with Killing from Ferguson to NYC | Democracy Now! Just a week after a grand jury in Missouri cleared police officer Darren Wilson for the killing of Michael Brown, a New York grand jury cleared New York City police officer Daniel Pantaleo for the killing of Eric Garner, who died after being placed in a chokehold. Both officers were white. Both victims were African American. Thousands flooded the streets in New York City last night after the grand jury decision was announced. Democracy Now! was there and interviewed several people about why they were taking part in the protests. We speak with Vince Warren, executive director of the Center for Constitutional Rights, about how the grand jury system can be used to shield police officers from prosecution. We also hear from retired NYPD detective Carlton Berkley about department restrictions on the use of chokeholds. AMY GOODMAN: Vincent Warren is with us right now, executive director of the Center for Constitutional Rights. Vince, yesterday the Staten Island grand jury cleared Daniel Pantaleo, the officer who actually put Eric Garner in that chokehold. Your response? VINCENT WARREN: As a lawyer, I was absolutely shocked by this, because, really, when you have video evidence like that, the evidence that we all saw, that tells more than half of the story. What I think really ended up happening was that the prosecutor, very much like Ferguson, I understand, presented all of the evidence to the grand jury; it was essentially a failing to secure an indictment. It’s the prosecutor’s responsibility to get an indictment. And when the prosecutor starts shifting the blame and people start thinking, “Oh, it was the grand jury that didn’t indict the police officer,” that’s when we know that we have a problem. It’s a systemic problem where the prosecutors are not taking responsibility for what their jobs are. NERMEEN SHAIKH: Well, could you explain what a grand jury is, when it’s called and what the failures of that system are? Because we saw the same thing in Ferguson just two weeks ago. VINCENT WARREN: Sure. Grand juries are an—it’s an old process that actually came from England. And very often, prosecutors will convene a secret group of jurors to hear information and evidence in order to determine whether charges can be brought against the person that they are seeking to charge. And so, in both of these cases, the prosecutors convened these grand juries. But what was different about these grand juries than most is that the prosecutors laid out all of the evidence and essentially asked the grand jury to figure it out. Everybody knows that you can indict a ham sandwich if you do it right. There are hundreds of thousands of black, Latino men that get indicted every single day—and a lot of them for nothing. So it’s really shocking that we have a police officer with this videotape, when all you really have to do is to show the tape, hand out the popcorn and say to the grand jury, “Well, how do you vote?” That’s how you secure an indictment on this case. You don’t have a big broad conversation about what the police officer was feeling at the time. AMY GOODMAN: How rare is it not to secure an indictment? AMY GOODMAN: Eleven of 160,000. VINCENT WARREN: Exactly. And it is even more rare to get an indictment when it has to do with a police officer. And that’s what the issue is here. It’s the fact that they’re cops that are in the dock that changes everything for the prosecutors. NERMEEN SHAIKH: But what role do district attorneys play in the way in which a grand jury unfolds? A number of people have pointed out that Staten Island District Attorney Daniel Donovan was considered pro-police. VINCENT WARREN: It’s hard to be a district attorney in America and not be pro-police, for the following reason: Your entire job description depends on cooperation with the police department. Police officers present evidence, they preserve evidence, they collect evidence, and they give witness testimony in virtually every criminal trial in America. And then, now we’re trying to pretend that these same prosecutors and police officers that work together every single day should be on other side—opposite sides of the “v” and that they’ll both be acting in independent ways. It simply doesn’t happen. AMY GOODMAN: So when a police officer kills someone, should there automatically be a special prosecutor? VINCENT WARREN: Absolutely. And I wouldn’t even limit it to killing. I think that in any opportunity for the district attorney to prefer any criminal charges against a police officer, that there should automatically be an independent prosecutor to avoid what we all know is a conflict of interest between the prosecutor’s office and the police department. NERMEEN SHAIKH: Well, on Wednesday, Attorney General Eric Holder said the Justice Department was launching a federal civil rights investigation into the death of Eric Garner. He also stressed that all lives must be protected equally. ATTORNEY GENERAL ERIC HOLDER: Now, we’ve all seen the video of Mr. Garner’s arrest. His death, of course, was a tragedy. All lives must be valued. All lives. Mr. Garner’s death is one of several recent incidents across our great country that have tested the sense of trust that must exist between law enforcement and the communities they are charged to serve and to protect. This is not a New York issue nor a Ferguson issue alone. Those who have protested peacefully across our great country following the grand jury’s decision in Ferguson have made that very clear. NERMEEN SHAIKH: That was Attorney General Eric Holder. So, Vince Warren, could you talk about how you feel the Department of Justice has responded to this case and what you feel ought to be done? VINCENT WARREN: Yes, and just let me give you a little bit of real talk to the attorney general on this. The issue is not whether all lives matter. Of course all lives do. The fact is that black lives don’t matter in the criminal justice system. So it would be extraordinary to have our first black attorney general to be able to be a little bit more nuanced in the analysis. But the attorney general and the president can do more than this. The DOJ, the Department of Justice, can defund police departments that don’t—that do discriminatory practices, and they can defund and provide incentives for good police practices around the country. And I’d like to see that, as well. 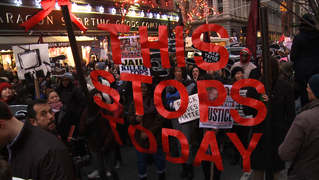 AMY GOODMAN: I wanted to go to the one person who was arrested after Eric Garner died. While Daniel Pantaleo will not face charges for choking Eric Garner, a Staten Island grand jury did indict a man who filmed the entire incident. In August, a grand jury indicted Ramsey Orta on weapons charges stemming from an arrest by undercover officers. Ramsey Orta spoke to Time magazine about what he’s been through since he filmed the fatal encounter. RAMSEY ORTA: I’ve been harassed by cops since this happened. Anything, like just don’t interact physically, just pull out a camera, and that’s all people need. Not only New Yorkers getting abused by police, it’s everywhere. I just hope it gives people the courage to not be scared of these people, because it’s a lot of “he said, she said.” But once you have proof, nothing could go against that. AMY GOODMAN: So, that’s Ramsey Orta, this young man. And when I went to the protest, straight from Ferguson to Staten Island, when a thousand people marched, I saw Ramsey and his wife Chrissie Ortiz. They were standing right on the stoop where Ramsey filmed. We were right next to that beauty salon where Eric Garner was taken down. I asked to talk to them. They were too afraid. It was not only Ramsey who was arrested the day after the city medical examiner declared Eric Garner’s death a homicide, but then his wife Chrissie Ortiz was also arrested. VINCENT WARREN: This is how the power structure works. I mean, it’s almost a too perfect of an example, where the police officer that chokes a man to death doesn’t get indicted; the man that films the police officer choking the man to death gets indicted, and his entire family is pressurized. This is not random happenstance, and this is actually the orderly working of our criminal justice system, where police officers have so much power and control that they can put pressure on witnesses, that they can make people’s lives miserable, until they get the result that they want. But the result that we want as a society is one in which where we see these types of horrible police practices, whether happening on videotape or not, where we can feel confident that there will be accountability for police officers. And I don’t think anybody—anybody—in America feels that there can be accountability for a police officer for killing an unarmed black man at this moment in America. NERMEEN SHAIKH: Well, on Wednesday, New York City Mayor Bill de Blasio said he and his wife, Chirlane, fear for the safety of their teenage son, Dante. NERMEEN SHAIKH: That was New York City Mayor Bill de Blasio speaking yesterday. Bill de Blasio is married to an African American so his children are also African-American. Vince, could you talk about what you think the city’s response has been to this decision, and, in particular, what the mayor had to say? VINCENT WARREN: I’m very appreciative that the mayor is not only talking from a policy perspective and also from a personal perspective. I also have two teenagers at home, black teenagers at home, and I deal with the same question, as my parents dealt with me. But there is—this is actually a time where the mayor can put his money where his mouth is. There are real opportunities for change here. And the number one thing that he has to do is he has to talk to his police commissioner and get rid of this horrible “broken windows” policing policy that led to the death of Eric Garner. NERMEEN SHAIKH: Could you explain what that is? What is the broken window policy? VINCENT WARREN: Sure. Broken windows is a policy that’s been brought in by Bill Bratton. It’s been around for a very long time, precursor to stop-and-frisk, which the Center for Constitutional Rights just recently got struck down. But it goes after low-level incidents and crimes, and gets the police department in the position of giving tickets for people that don’t walk their dogs with a leash or walk through the parks, and that these are—the theory is that by cracking down on those types of incidents, that they get to the bigger fish. The reality is, by cracking down on those types of things, they end up spending time and resources pushing forward prosecutions of relatively innocent black and Latino people in poor neighborhoods. It’s a problem that has to go. The second thing that has to happen is that we have a joint reform process in the stop-and-frisk case where the police department, the police union and other activists and community members are going to come to the table, and this is the point where the community gets to say, “We want to talk about how we are being policed.” That’s the solution that we’re all looking for. It’s not commissions, and it’s not conversations. It’s getting the people that are affected in the communities at the table and to lay out the real deal for how the problem is, and then to come to solutions from that. AMY GOODMAN: Last night I went up to the National Action Network headquarters up on 145th Street. Reverend Al Sharpton held a news conference with Gwen Carr, Eric Garner’s mother, as well as Esaw Garner, his wife, to respond to the Staten Island decision. And afterwards, I saw Carlton Berkley. He’s a retired police detective here in New York, longtime member of 100 Blacks in Law Enforcement Who Care. And I asked him afterwards if he could talk about what exactly Pantaleo did. So he pulled out the NYPD patrol guide for officers and read the restrictions the guide outlines on the use of chokeholds. CARLTON BERKLEY: And it states here in the patrol guide procedure 203-11, the use of force, and it states, “Members of the New York City Police Department will NOT use chokeholds. A chokehold shall include, but is not limited to, any pressure to the throat or windpipe, which may prevent or hinder breathing or [reduce] intake of air.” That is exactly what happened in the Eric Garner case. AMY GOODMAN: So that’s Carlton Berkley, retired NYPD detective. He said other officers on the site should also be held accountable for Eric Garner’s death, not just Officer Pantaleo, who used the chokehold. Here, Detective Berkley reads again from the NYPD patrol guide. So, therefore, what I just read you, technically, those other officers should be held accountable, because with this man saying 11 times, “I can’t breathe,” when was any of the others going to say, “Hey, get off him. He can’t breathe”? AMY GOODMAN: So, again, that’s Carlton Berkley, retired New York police detective, talking about two issues. One is the one that apparently in the grand jury—and we have yet to see the notes of the grand jury—Pantaleo actually said he did what he was taught in the academy. He was actually wrestling, using a wrestling move, not a chokehold, which is illegal in the police guide. And the second point is this issue of everyone else who was there, all the other officers. Look at how they held him down. If a group of us attacked someone here, we would all be held accountable. VINCENT WARREN: Absolutely. And this highlights—there are two things that are highlighted. I think number one is that there tends to be a focus on the one police officer, and people want to talk about particular techniques that they use. And that’s part of the problem, but that’s not the whole problem. We have what we know as the “blue wall of silence.” And everybody knows—real talk—everybody knows that police protect their own. Everybody knows that police officers will lie to protect their own. Everybody knows that the goal of policing is to not get caught doing a criminal act. And so, we have a situation where—I agree—every single one of those police officers who were there that failed to stop it, the people that failed to report it, the people that said that it wasn’t something that we all know that it is, should face charges, just like any of us would if we were in that same situation. There are two rules in America: There’s rules for police, and there are rules for the rest of us. And that’s the problem that this particular criminal justice system is failing to solve. And that’s why people are out on the streets, because we need something new. It’s not working. NERMEEN SHAIKH: Well, could you also talk, Vince, about the question of proportionality? Because one of the things that was very striking last night, and also two weeks ago when the Ferguson protests happened, is that there’s such an enormous and what appears to be massively excessive police presence for, you know, peaceful demonstrations, vans upon vans of police officers. What is the relationship between—two things—first, the number and—I mean, what appear to be too many police officers for a peaceful demonstration, and second, the military gear that appears more and more frequently in public spaces used by the police? VINCENT WARREN: In Ferguson, as they were doing, and even when they’re here and they’re cordoning off protesters and trapping them, as they have here in New York over decades of protests, and then saying, “OK, now you have to disperse,” but people can’t disperse, and they arrest everybody. These are tactics that the police use not just for social control, but this is also social justice control. And that’s the problem that we have. AMY GOODMAN: I want to go to two questions. It has been now debated for—throughout the night in the media, was it an illegal police chokehold? Yes, it was a violation of the patrol guide, but was it illegal? Now, in New York, a 2010 law was passed—it was actually dealing with domestic violence—about strangulation. It’s second-degree strangulation, choking to the point of injury, impairment, stupor or unconsciousness, can leave ambiguous marks or no marks at all. And I guess it was passed to deal with this issue. Why isn’t this illegal, even if the officer says in the grand jury, “Oh, I thought I was doing something else”? VINCENT WARREN: Yeah, I haven’t read that statute, and that may apply to police officers, or it may not. But let’s assume that it does apply to everybody, as most laws do. AMY GOODMAN: It’s just a law. VINCENT WARREN: Of course the police officer can be charged with that. There’s no reason why they can’t be. And at some level, it doesn’t matter whether he says, “I was doing what I was told,” or “I doing what I was taught,” or “It really wasn’t a chokehold, it was a wrestling move that crushed the windpipe.” It ends up with the same thing. This is an aggressive action, a homicide, that killed a man. And so, but the law—and the prosecutors should be good enough to be able to find what areas of law it violates and indict them for that. AMY GOODMAN: Are these grand juries being used as substitute trials, but in these both cases, in Ferguson and New York, only one side is presented? Because it is a grand jury, it’s just supposed to be about an indictment, so you don’t have a cross-examination of the police officer, in both cases. You know, when a police officer comes before a grand jury, they are humanized, so you get just their side of the story. And because it’s not a trial, could they be indicted if it’s found something was wrong with this grand jury? Like in Ferguson, the question of the law the grand jury members were presented with, was it wrong? VINCENT WARREN: So, the answer to the first question, that we’re seeing in these types of police cases, is that the prosecutors are treating this more like sort of a Wikipedia, roll-your-own kind of trial, where all of the evidence is there. That’s not how they’re typically done. Usually they’re presenting a concise set of information that is designed to lead to an indictment. AMY GOODMAN: Right, they’re acting as the defense attorney rather than the prosecutor. AMY GOODMAN: And then you don’t have the other side. AMY GOODMAN: Could they be recharged? Could there be another grand jury? It’s not a trial. VINCENT WARREN: Grand juries can be reconvened by the prosecutor. They can bring in another grand jury, and they can move the same information forward. But that becomes the political problem. I think that it would be unreasonable to expect this Staten Island district attorney, working so closely with the police officers and relying on them for his livelihood and his job, to start another grand jury proceeding. I don’t see that happening. AMY GOODMAN: But at the federal level? Ferguson, it was—I mean, the word on the street when I was there is it’s not going to happen, civil rights charges at a federal level, but maybe is that changing? VINCENT WARREN: It should change. I don’t know the information, but I know that in New York that there was another asphyxiation death involving Anthony Baez almost 20 years ago, and that police officer, Francis Livoti, was indicted. He was acquitted at trial. Then the federal government came in. They indicted him on new charges, and then he was convicted. So there is a longer road that happens here. But they need to build faith that they’re going to do this the right way and they’re not going to just throw their hands up and say, “Sorry, we tried,” because that’s not good enough. AMY GOODMAN: And as we wrap up, today is the 45th anniversary of the police killing of Mark Clark and Fred Hampton in Chicago, when the police moved into their home—they were sleeping—and killed both Black Panthers. Fred Hampton was the head of the Black Panther Party of Chicago. AMY GOODMAN: Vince Warren, thanks so much for being with us, executive director of the Center for Constitutional Rights. When we come back, we look at the new nominee to be head of the Pentagon, the secretary of defense. Stay with us.